There is no better researcher than a woman with a craving, or so it seems! 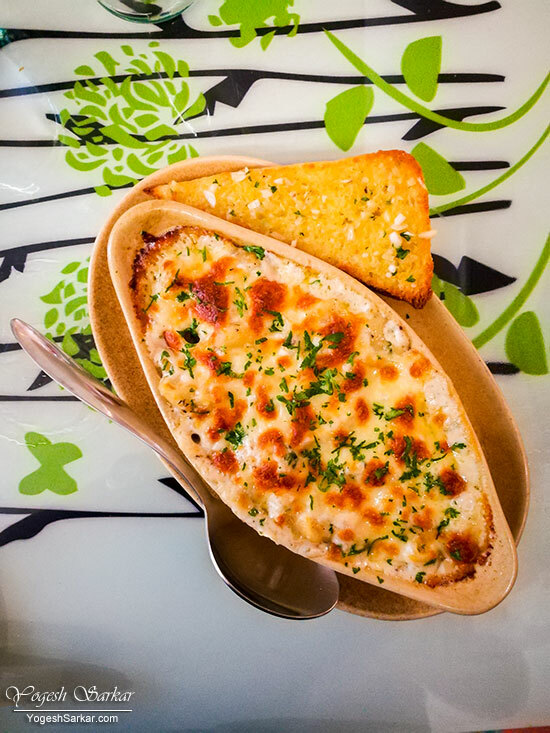 With RD in the mood to eat Mac and Cheese, she managed to find a perfect place for us to dine after shopping at Decathlon Noida, Bohemia at Garden Galleria Mall. Of course finding a place that served Mac and Cheese was easier than finding a way to the restaurant in the mall. 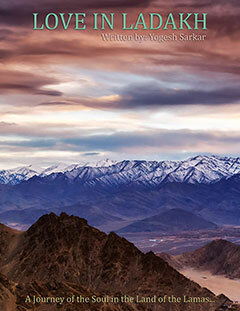 It took us a while, before we ultimately found a way out to the terrace and Bohemia. 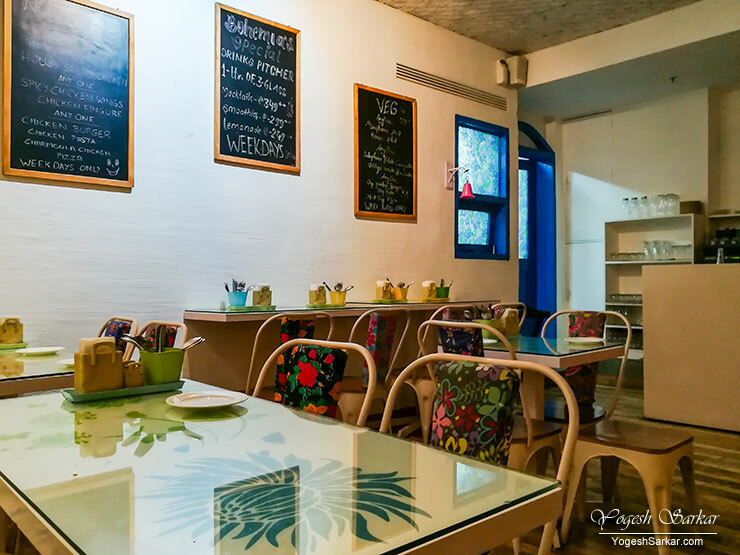 And when we reached there, it was completely empty, with pretty much all the patrons ending up at Café Coffee Day or Laat Sahib, located on the either side of this Mediterranean restaurant. 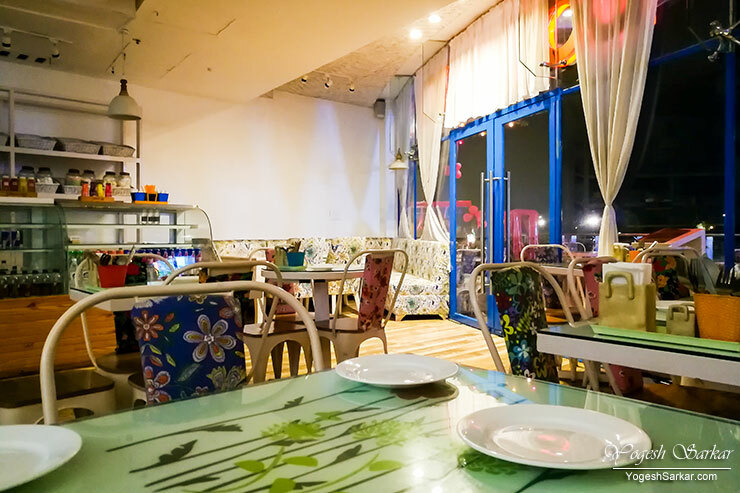 However, it looked like a quaint place and we really wanted to try out Mac and Cheese, so we decide to step in. After going through the menu, we decide to order an Apple and Mayple Milkshake, Mezze Platter and of course, Mac and Cheese. I am not sure why they had written Mayple instead of Maple on their menu, but it did confuse me a bit initially. 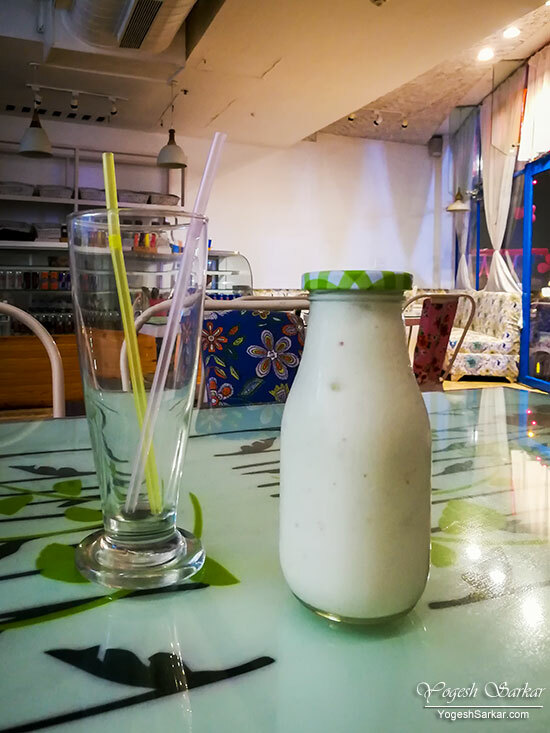 Anyways, the first to arrive was the Apple and Mayple Milkshake, consisting of pilled apple, strawberry, yogurt, mayple syrup, vanilla ice cream and milk. I liked the way they served the milkshake in a small milk bottle, along with a glass. Unfortunately, unlike Keventers, you cannot take away the bottle :D. As for taste, I expected it to taste sweet, but it wasn’t. It was refreshing and there were bits and pieces of apple and strawberry in it. However, it was light and very low on sweetness. Overall, it was fine, just not up to my expectation of a rich and sweet milkshake. Next to be served was the Mezze Platter with falafel, pita bread, lavas, tabule, Greek pickle, hummus and garlic yogurt. 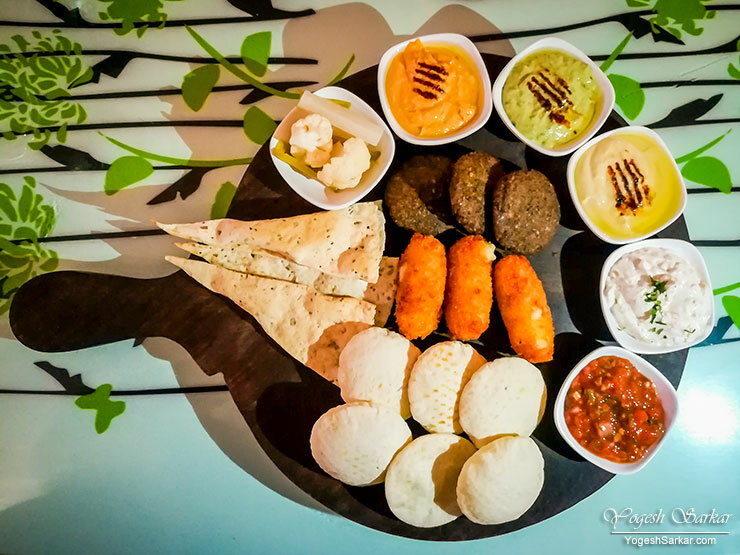 In terms of taste, Mezze Platter was superb, beating the Mezze Platter we had eaten at Odeon Social by a long margin when it came to flavor. Hummus, in particular, was rich and full of olive oil, something I have rarely seen at most of the restaurants serving Mediterranean food in India. The only disappointing bit was the Greek pickle, which was almost bland! Next up was the much awaited, Mac and Cheese! It was rich and delicious, with the copious amount of olive oil adding to the flavor. 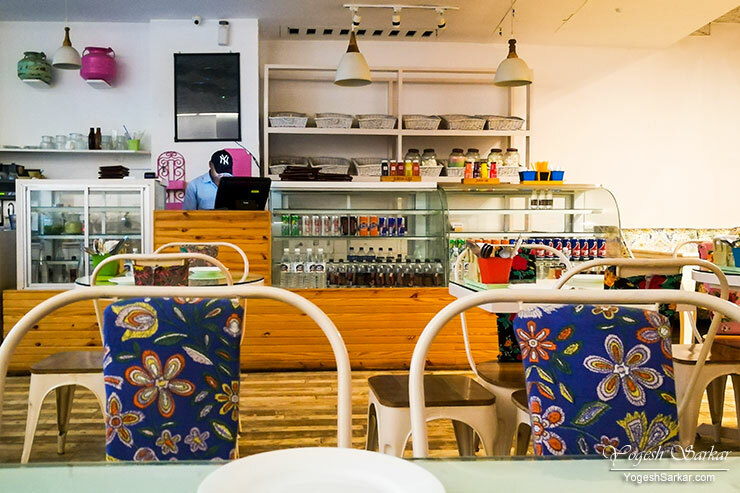 The reason behind dining at Bohemia had been fulfilled deliciously. Though the garlic bread had a fairly strong and a bit acidic taste. 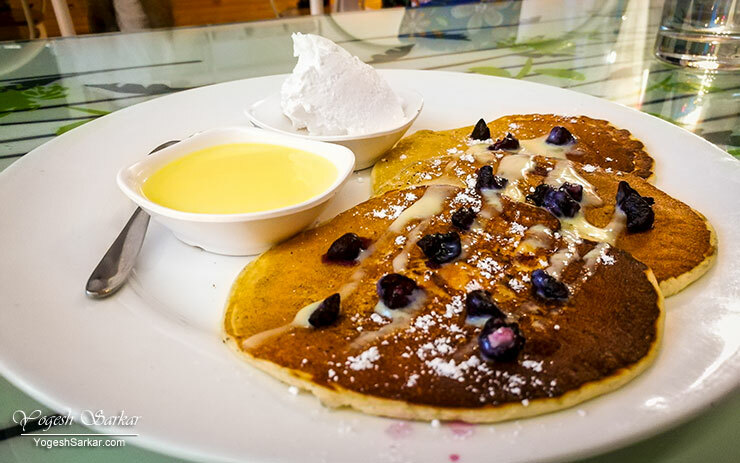 Having had such delicious food, I became a bit greedy and ordered Custard and Berries Pan Cakes (vanilla custard, assorted berries, and whipped cream.) Even though what I really wanted was waffles, however, it wasn’t available at that moment. So I had to settle for pan cakes. Unfortunately, pan cakes weren’t that good. With a sour taste, custard being too light in consistency and sweetness, whipped cream was the real savior and helped us finish off the pan cakes. Service overall was quite decent, but then again, initially we were the only ones there and later couple of people came in. Food at Bohemia, for the most part, was good, which is surprising, considering few if any people seem to visit it! Bill for Apple and Mayple Milkshake, Mezze Platter, Mac and Cheese, and Custard and Berries Pan Cakes came out to be Rs. 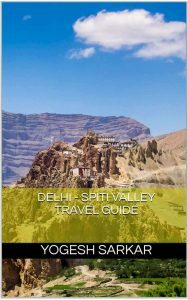 1,208, which is neither cheap nor expensive. 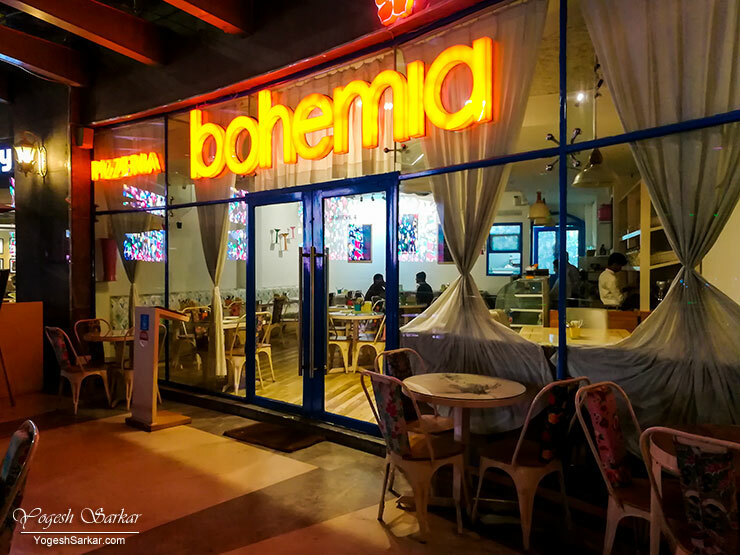 I guess we might end up revisiting Bohemia if we once again crave for Mediterranian food in Noida.